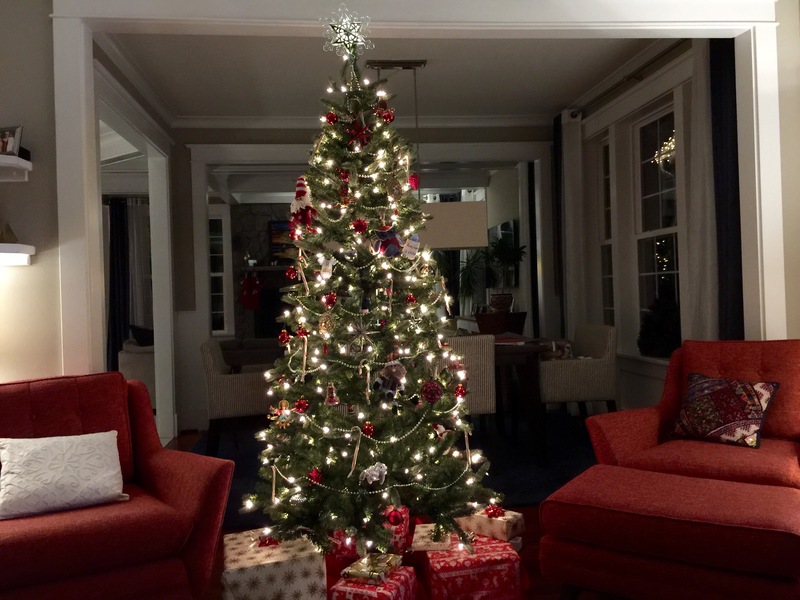 2015 was a great year for Forest Glen and just in case you missed some of the action – here is our Top 10! Finding Forest Glen founded! FFG starts covering issues in April – beginning with the Forest Glen Park redevelopment project. Forest Glen and Montgomery Hills become one! MoCo announces that the two areas are going to be treated as one area for sector plan purposes – creating the possibility for a better future and sense of place. Purple line gets approved! With Gov. Hogan making the most anticipated transit decision of the year – a proposed Purple line stop near the Forest Glen annex could redefine the Forest Glen area. MoCo announces its priority list for transportation projects – and the Forest Glen Georgia Ave tunnel makes the cut! FFG and Just Up the Pike team up to host the Forest Glen Redevelopment Meeting! Residents gathered to discuss the future of the Forest Glen Parking lot and what that redevelopment could look like. FFG releases the Forest Glen Redevelopment Report – A Community’s Voice! FFG makes its debut on Greater Greater Washington! FFG joins forces with Around the Corners! FFG covers the Forest Glen station’s fence and bus bay issue! And finally – FFG’s Retail survey is a huge success! Residents want retail, retail and more retail. So what’s in store for 2016? Look for WMATA to come out with a decision on how to redevelop the Forest Glen station parking lot as well as a detailed RFP (Request for Proposal). MoCo will also start planning the new sector plan for Forest Glen as it merges with Montgomery Hills. Also look out for a special announcement by FFG on a exciting spring project for the community. Until then – best wishes and Happy New Year from your friends at FFG. Thank you for your support and here is to a brighter and exciting future for Forest Glen! From your friends at Finding Forest Glen! Not in Forest Glen – BUT are you looking for a new AUTHENTIC Korean restaurant in DTSS? Check out Bibim – serving casual, comfortable, fun and affordable food with a “flavor” for vegans, vegetarians and gluten free diners. Forest Glen Metro CLOSED SUNDAY 12/13/2015 (7am-2pm). Full-scale emergency response drill planned. The live exercise will allow emergency personnel to practice their response to two separate exercises: one involving a smoke/fire incident inside the tunnel outside Forest Glen and another involving a suspicious package on a bus. In addition, the exercise will simulate real-world conditions to test ventilation fan systems, and coordination and communication between emergency responders on scene, rail operations staff, Transit Police and support personnel. Does Forest Glen Station really need a Bus Bay? The Forest Glen Station has one of the most underutilized bus bays in Montgomery County. With approximately 2,400 commuters using the station daily, less than 1% of this number use the station’s bus bay. One of the reasons for this low number is the location of the station. Nestled between two larger metro stations that are served by major bus routes, the Forest Glen Station has a bus bay redundant in nature given the various bus options at the Silver Spring and Wheaton stations. 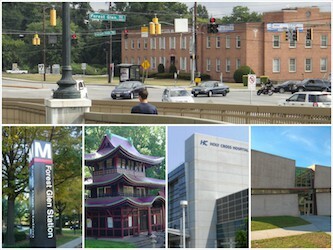 With Wheaton and Silver Spring stations having over 20 different bus routes, the Forest Glen station is primarily serviced by only two bus routes – the 7 and 8 buses. According to data obtained directly from Montgomery County’s Department of Transportation (MCDOT), approximately 15-20 people use the Route 7 service daily at Forest Glen (boarding/alighting at the station itself). Route 7 uses the Forest Glen Station as a terminal site and provides peak direction service between the Wheaton Station and Forest Glen. The Route 8 service operates all day and Saturdays between the Wheaton Station and Silver Spring Station with a diversion to the Forest Glen Station and Holy Cross Hospital. 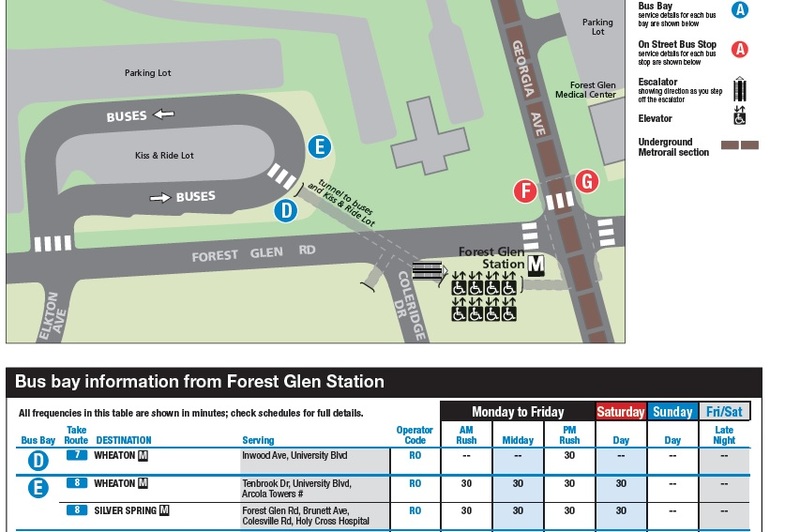 Approximately 40-50 people per day use the Route 8 at the Forest Glen Station. With such low ridership, the 7 & 8 bus routes can either be eliminated, re-routed to other adjoining stations, or added to the existing Georgia Avenue bus line system. Physically, the underutilized bus bay occupies a whopping 2.3 acres or almost 30% of the current 8-acre site. 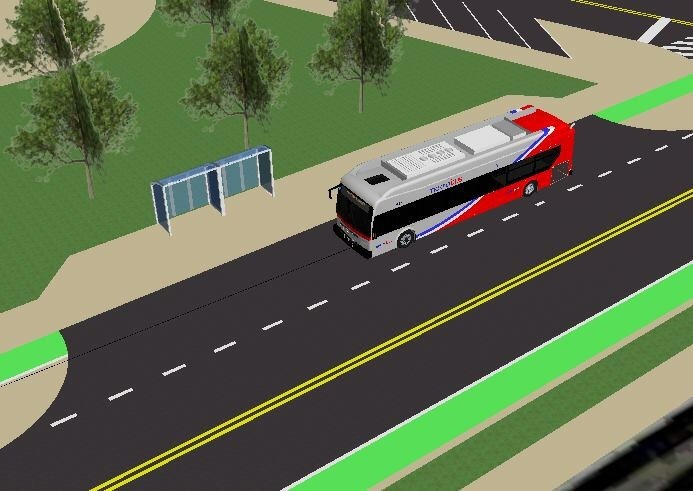 With Forest Glen being the subject of redevelopment, WMATA could not only eliminate the bus bay as part of its redevelopment proposal, but such a change would also open up precious land for potential green space. 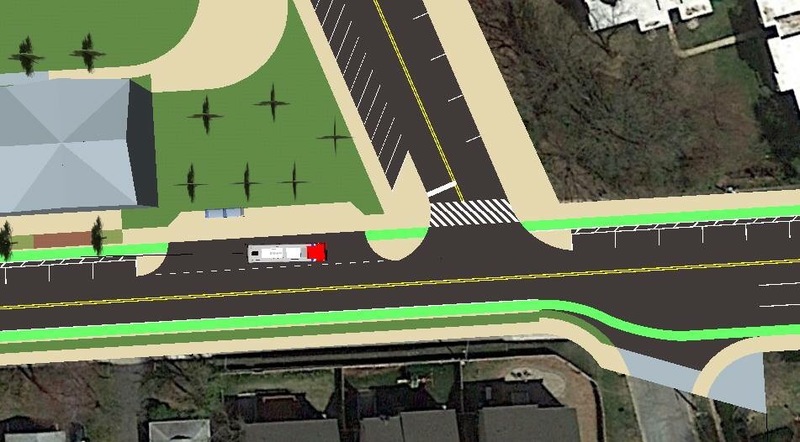 Alternatively, the bus station could also be moved from the station’s current bay to an on-street bus stop on Forest Glen Road. The new bus station could provide an adequate facility for the existing 7 & 8 lines, along with the Holy Cross shuttle service, and would only be located one hundred feet from the current bus bay. With space opening up from eliminating the bus bay at the station, Forest Glen Road could be altered to include an “indented” bus station just off the main road. Such a bus stop exists on Rhode Island Avenue in the City of Hyattsville, which is currently served by three bus lines (81, 83, and F8). This type of configuration allows buses to stop for passengers in their own space, without obstructing traffic flow in the travel lanes of the road. A bus pocket on Rhode Island Avenue at the judicial complex in Hyattsville, MD. Image from Google Streetview. Bus stop concept on Forest Glen Road next to the current Metro station bus loop. Model by Sean Emerson. If such a bus pocket were built on Forest Glen Road, any buses or shuttles servicing the station would have plenty of space to pull over without disrupting traffic flow on Georgia Avenue or Forest Glen Road. With the new bus pocket on the westbound side of Forest Glen Road, buses would need a way to make a loop to return eastbound towards Georgia Avenue (as both the 7 and 8 do today). A street extension into the current Metro site could enable a new block to form, which buses in turn could use to loop around and go east on Forest Glen Road. See the diagram below. Proposed new bus route. Image from Google Maps. The street requiring an extension (Elkton Avenue), is currently just a short block between Ellis Street and Forest Glen Road. Constructing the street through the Metro site would extend it to Kimball Place (the east end of which is the entrance to the Metro parking lot and therefore WMATA owned). This extended street would also create a new block for potential redevelopment, similar to how Grand Park Avenue was built through a former parking lot in White Flint to create a new “main street” for the Pike & Rose development. Extended Elkton Avenue (center) model through the Forest Glen Station parking lot with bus pocket. Model by Sean Emerson. With the Silver Spring Transit Center finally opening and the Wheaton station subject to major redevelopment, both stations have a plethora of bus route options that are likely to expand in the future. As Forest Glen redevelops, re-imagining its bus service and traffic management could translate into even more open space and give Forest Glen a greater sense of place than ever before.